Previously known as The Alto Cucina and Bar, the new look space, now known as the Beachside Pavilion Broadbeach opened its doors in late 2017. Beachside Pavilion is part of the Gold Coast institution food scene that stems back 20-30 years. As part of a huge refurbishment program outside the Oasis Shopping Centre Broadbeach the owners set to work creating a very different dining experience. Beachside Pavilion is aptly named as it sits at the beach end of Broadbeach. The new Hampton style, beach vibe fit out gives way to a cheeky Aussie beach theme. The various floor coverings (I counted 4) works well to create a relaxed laid back vibe, as does the high tables and light timber tables, chairs and screens. Laid back isn’t how I would describe the service though as the half dozen times we’ve eaten at Beachside Pavilion the service has been excellent. We’ve dined alone and with friends and each time the food delicious. I must admit we haven’t ventured off the seafood lunch or dinner trail. 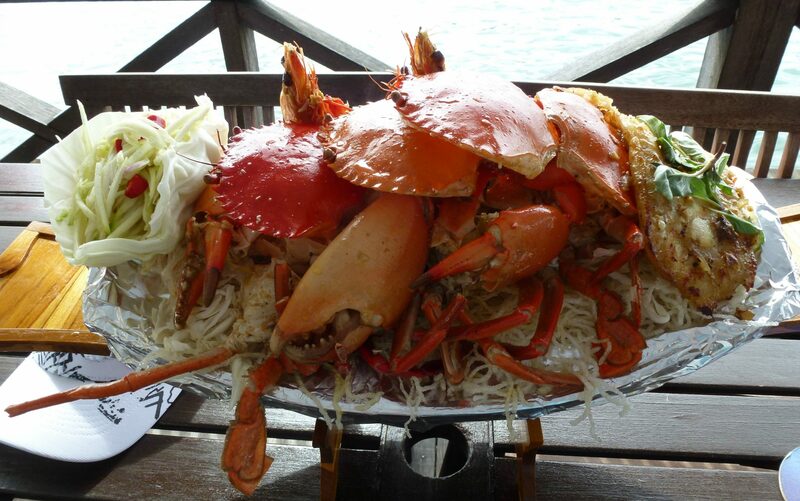 It’s very difficult to choose another dish when the seafood is so fresh and mouth-wateringly good. We always think it’s a waste to order something off a menu when the restaurant is specialising in a particular food. I always did think it was odd when my dear old Dad ordered a T-Bone steak at our local Chinese back in the day. Order this Granddaddy of dishes when you can’t decide because you want everything on the menu. 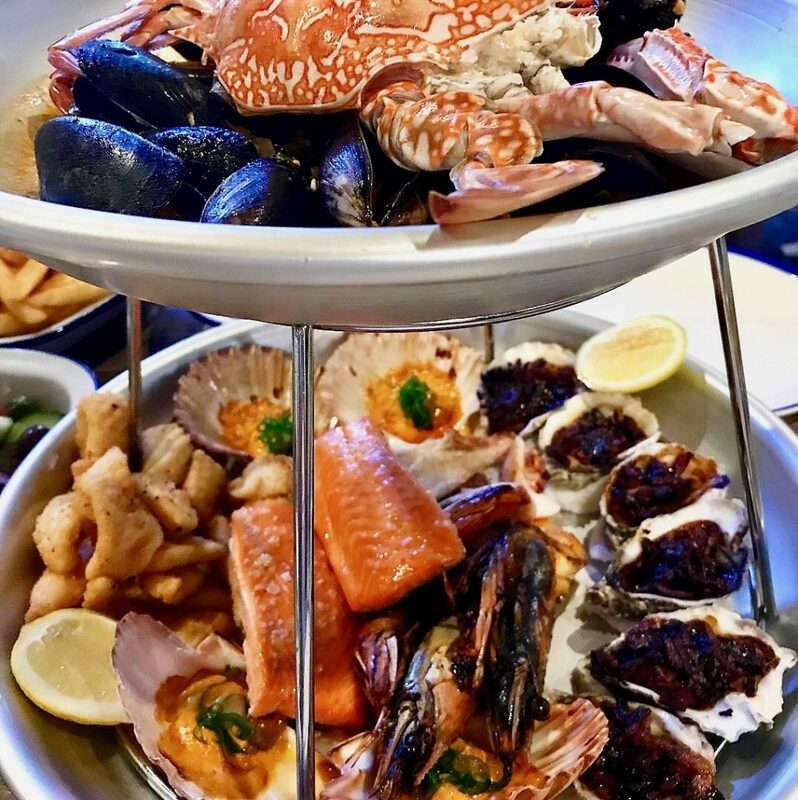 Is this the best seafood platter Gold Coast? 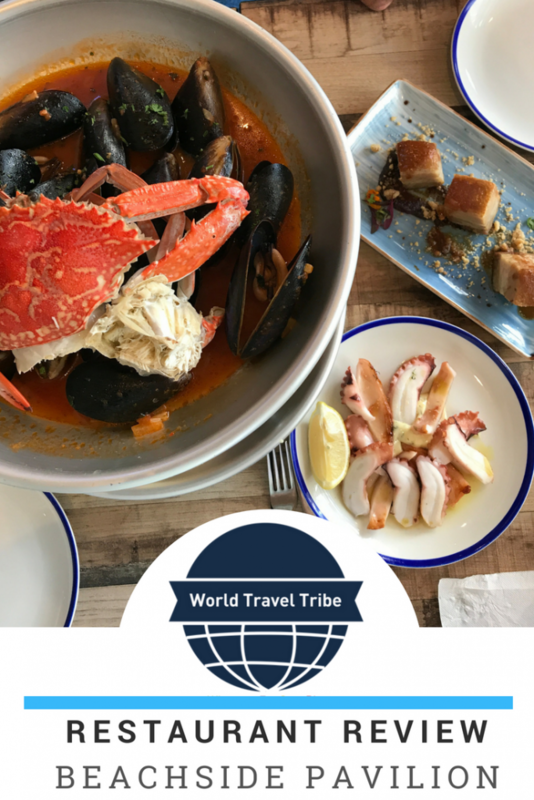 That’s a big call I know as there are many firmly established seafood restaurants Gold Coast that could take the converted award of the best seafood restaurant Gold Coast. And no doubt the best seafood platter too. 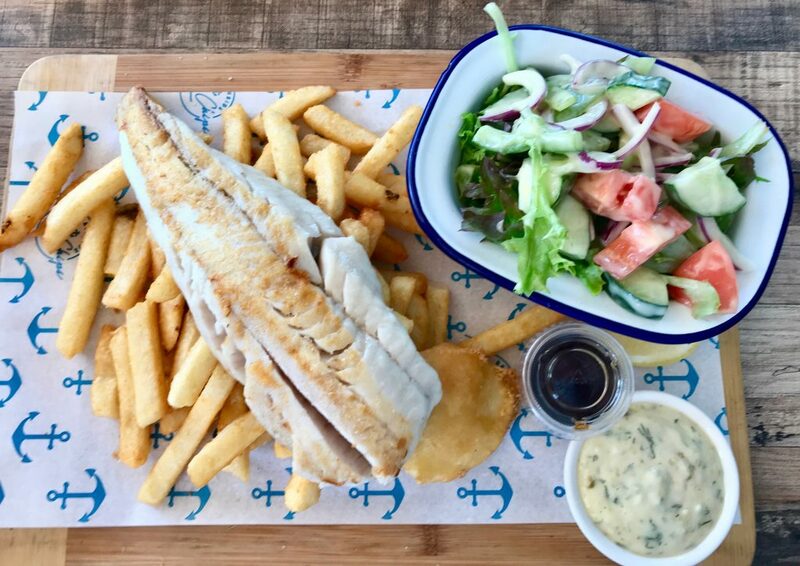 But there is a new kid on the block and they are throwing out a hard-to-beat challenge to the older established seafood restaurants of the Gold Coast. 3 of the 6 times we’ve eaten at Beachside Pavilion we’ve ordered the seafood platter. In fact, if it’s on a menu anywhere we find it hard to pass up. As we’ve tried a few here in Australia and around the world, this one is in our top 3. We rank it so highly for the freshness of the seafood, variety and of course quality. The seafood is either caught locally or from just south of the border in NSW. Even the salad taste’s fabulous must be due to the light vinaigrette that just adds to the freshness without drowning the delicate leaves. We found this seafood platter is a little more for 2 people to eat (although we had a good run at it). Perfect for 4 with a few added entrée dishes. In our last visit to Beachside Pavilion, we met friends who we ironically met the previous time there. Last time we ordered 2 platters between us. This visit we ordered one and some pork belly and octopus. On the other occasion we’ve dined there we ordered baked whole snapper and saffron linguine marinara. Both are excellent dishes. 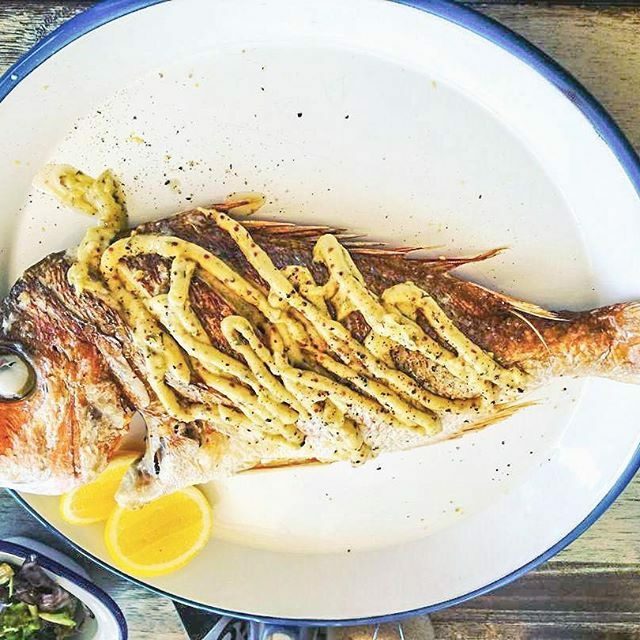 The whole snapper served is plate size and grilled to perfection. Just enough for the delicate flakes to fall off the bone. The snapper is served with lemon, mustard, olive oil, dill, chips and a salad. “One of the best marinara’s” he’s had according to Kevin. This dish is a selection of fresh seafood, tomato and a hint of chilli. 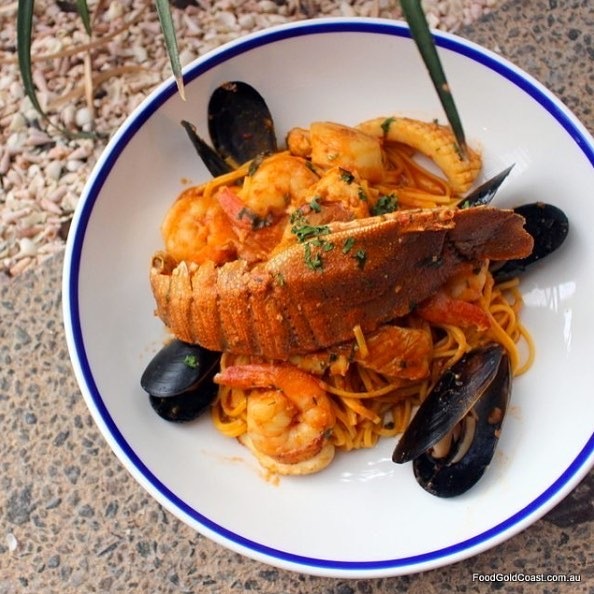 A hearty meal for the hungry who loves fresh seafood and pasta. We love Friday lunch, sometimes with friends and sometimes just the two of us. 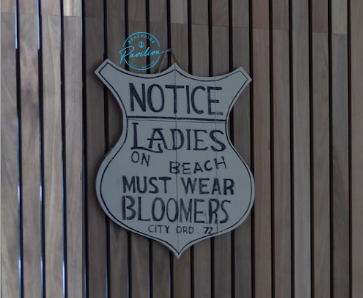 Often we’ll head to Broadbeach and on two occasions plonked ourselves at a table at Beachside Pavilion. 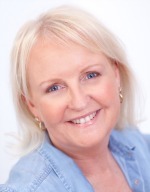 We are like homing pigeons to the good food and great service! Not wanting one of our very long lunches, we opt for simple fish and chips. The fish we’ve had for this humble meal is fresh snapper beautifully grilled for me and battered for Kevin. This dish is served on a board with perfectly cooked chips, crispy on the outside and fluffy in the middle. Fresh side salad, a potato cake, fresh lemon, tartare and what should always accompany fish and chips but rarely does, malt vinegar. The tender pork belly dish is served as an entree and made a great accompaniment to the seafood platter. 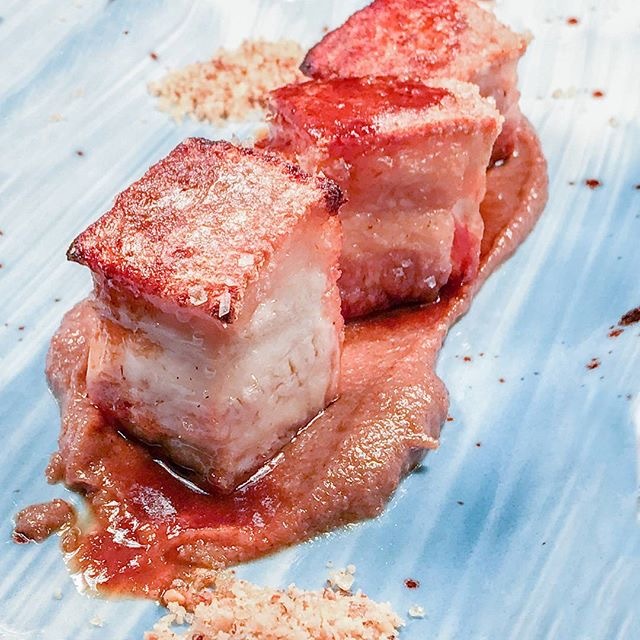 It’s served with a date puree which cuts nicely through the fattiness of the pork and a walnut praline for extra crunch. Less is definitely more when it applies to a good grilled octopus dish. The octopus dish ticked that box cooked in only olive oil and lemon with a little lime dill mayo on the side, for those who must overindulge. The grilled octopus is almost as good as the one we ate here. Grilled octopus is also great as an extra dish with the seafood platter if dining with others. We usually can’t move, never mind having any space for dessert when we’ve dined at Beachside Pavilion Broadbeach. 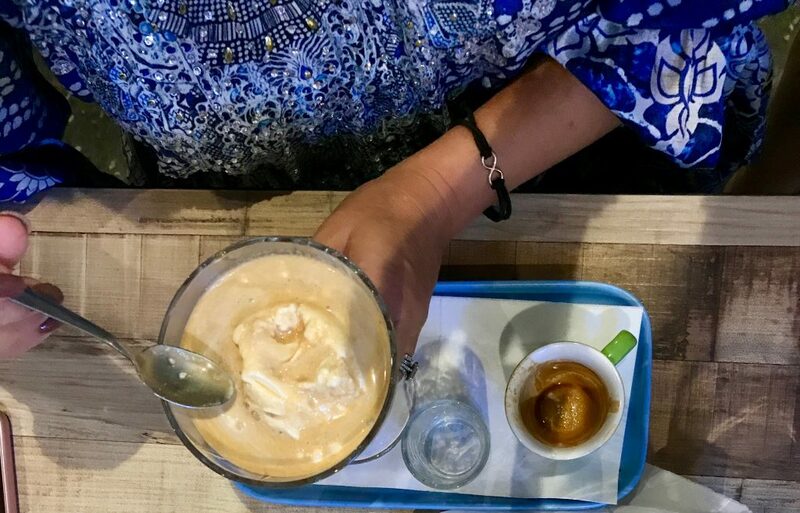 On one occasion, to finish a very long lunch with friends we indulged with a cheese platter and my favourite dessert, Affogato. If it makes an appearance on a menu I’ll order it. If it’s not and I feel like a dessert I’ll always request it. It’s pretty simple, vanilla gelato, short black and Frangelico liqueur. 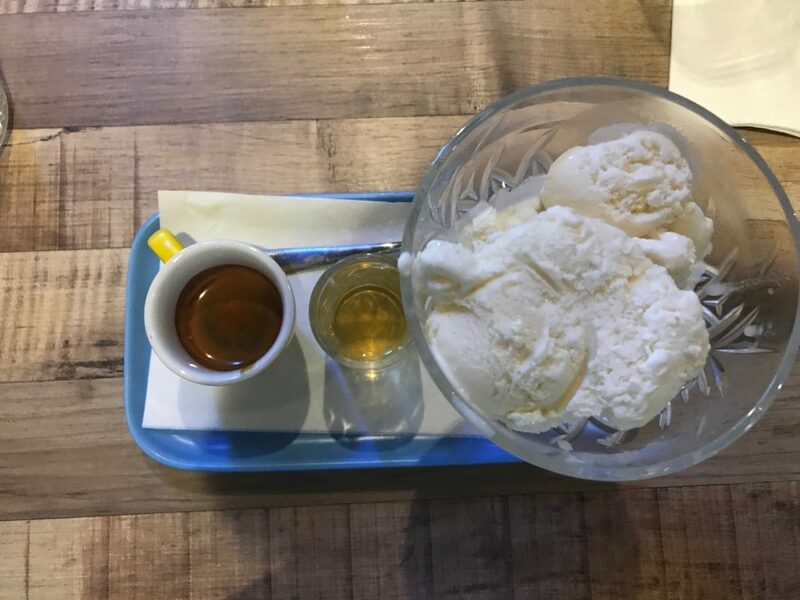 The 3 ingredients are served separately, which you could eat and drink that way, but why do that when you can still eat the gelato and then drink the coffee hazelnut mix afterwards? 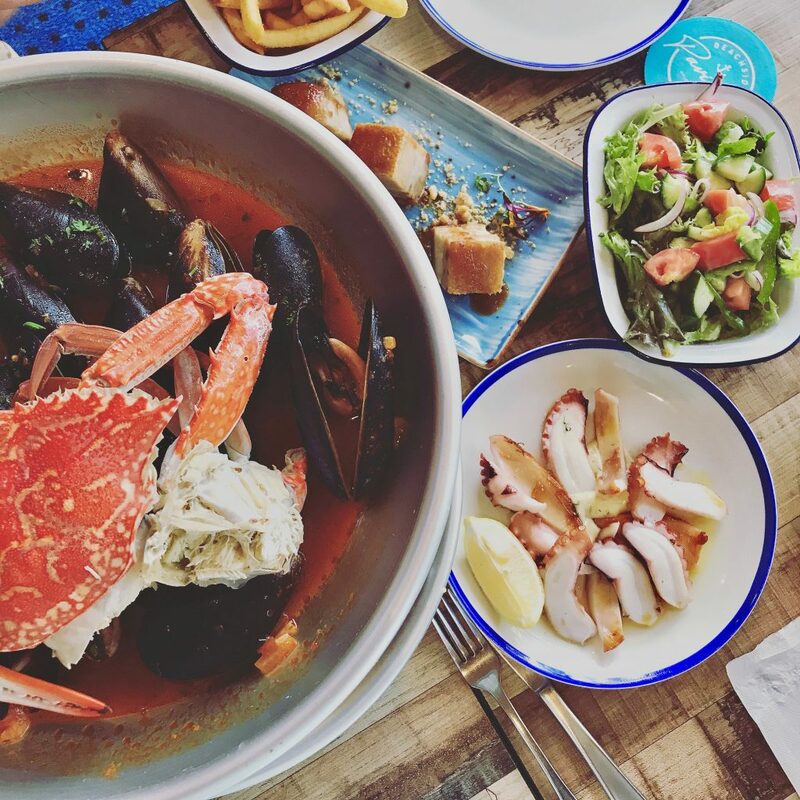 You’d be forgiven for thinking Beachside Pavilion Broadbeach is exclusively a seafood restaurant from this post. Let me clear that up, it’s not. It’s a steak and seafood restaurant and bar. The team also serve a pretty mean breakfast. In fact, they are all-day dining in Broadbeach with a great selection of Poke bowls too and takeaway fish and chips. Check out their Instagram account here where you will see all they have to offer. 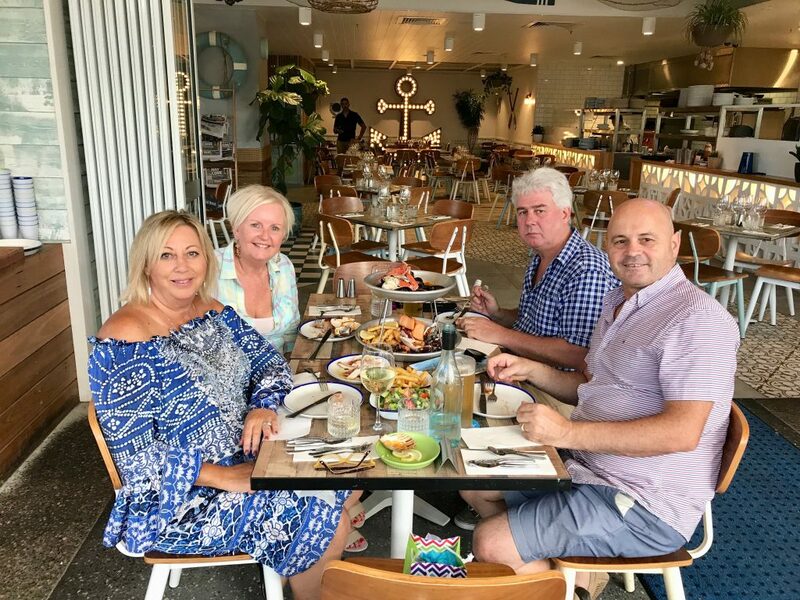 If you are a local on the Gold Coast or visiting the Gold Coast from interstate or overseas, make sure you add Beachside Pavilion Broadbeach to your list, you won’t be sorry! We highly recommend a visit to Beachside Pavilion for breakfast, brunch, lunch, dinner, or even a lazy cocktail or two from their bar.